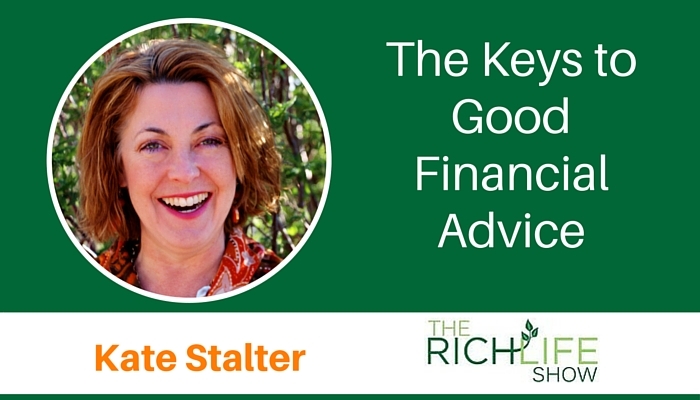 Writer and financial advisor Kate Stalter of the Better Money Decisions firm discusses the keys to good financial advice in today’s world. 00:00 Beau Henderson: We talk a lot about success with life and we talk a lot about success with money and guess what, I believe you can have both. And today’s guest I’m really excited, a friend of mine years ago she was actually doing a lot of writing for Investors Business Daily, the MoneyShow.com and we met through an interview there and today she’s even more focused with Better Money Decisions, her own firm, helping people basically set up retirement planning and financial planning the right way. Welcome to The RichLife Show, Kate Stalter. 00:33 Kate Stalter: Hey, Beau, thank you so much. I’m so thrilled to be a guest today. 00:37 Beau Henderson: Ain’t that funny I was going back through thinking about how we met and it was actually an article. It think it was the MoneyShow probably. A few years back. 00:48 Kate Stalter: I think so probably maybe around 2011 something like that and it is funny. I know I interviewed you a couple times for that. I think I found you in social media ’cause at the time I was looking around… ’cause I was doing those interviews everyday and looking for interesting people with a unique viewpoint to share with that audience. How about that? 01:12 Beau Henderson: Funny, that’s what I love about some of this, too, is just how you go out there to maybe educate our listeners and you make friends along the way. 01:20 Kate Stalter: Oh, absolutely that is one of the fun things and I currently write for US News. I do investing articles over there and I think I interview you for one of those as well. 01:31 Beau Henderson: US News and you also did some stuff with Forbes, I believe. 01:34 Kate Stalter: That’s right and it’s an interesting thing because exactly as you’re saying, it’s a great reason to just reach out to people say, “Hey, can you give me some comments.” and I’ve reconnected with folks maybe I even talk to in a while or made some new friends that way and just an interesting way to hear what’s going on out there in the financial services industry, what people are thinking. 01:56 Beau Henderson: Well, I know you use that knowledge and that background and shifted a lot of your focus to actually helping clients with this stuff and I love what you’ve done with the firm Better Money Decisions. Let’s talk about that there has to be a story behind that name. 02:10 Kate Stalter: Yeah there is. I worked for a couple of years, got licensed a few years back, worked at another registered investment advisor firm and after a while I saw that there were some things I was very excited about wanting to do to serve clients in a better, more transparent way to help them across the board. Because I think a lot of the financial services industry, and it’s changing for the better, but I think a lot of it in the old school style is still kind of geared towards assets to manage. And there’s nothing wrong with that at all per se. I mean, my company does that as well, but there’s this kind of I believe in old school approach to gathering assets under management. 03:03 Kate Stalter: And then, what is the value of having a financial planner, a financial advisor. Because if you watch all of these commercials that are out there, it kind of suggests that your financial advisor should be somehow timing the market or somehow improving upon what you can get in the market. And I believe there are a lot of mistakes to that particular approach. It sets up everybody for disappointment not just the client, most importantly but also I think it sets up the financial planner to be trying to do something that perhaps is not only not in the client’s best interest but really how is that helping anybody? I guess that’s the bottomline of what really bothers me about this traditional approach to gaming the stock market for lack of a better term. 04:01 Beau Henderson: I totally agree Kate. One of the things I’ve seen is that it really requires a lot of education for the consumer out there, because they’ve been pretty much indoctrinated into that model for so many years, probably since the early ’80s really is when this whole accumulate assets or a product is going to solve your needs as opposed to what you’re talking about, it’s more real. Let’s have a strategy, let’s all raise our financial IQ together and let me help you become a better investor. And I know you gonna do better overall and I’m here to hold you accountable and do some of those things that actually are the things that are truly important. 04:40 Kate Stalter: Yeah, that’s exactly right. As you’re saying that, I’m realizing that a lot of times you have to have these hard conversation with clients. That’s getting to heart of what an advisor should be doing. Not saying, “Oh, well, we can beat the market and if you buy this stock, this quarter.” I mean, I make the little joke with people I say you will never ever get that call from me saying, “We think energy is gonna be hot this quarter or sell all your tech… We’re never, never gonna talk to people that way. First of all, because everybody, I don’t care who you are, everybody has a pretty bad track record of trying to beat the market. I came into this industry, you mentioned Investor’s Business Daily, and I worked over there for 10 years, learned a lot, worked with a great group of people. What I learned, however, was the stock trading model that a lot of these companies that are out there emphasize. It has zero to do with a person or a families objective when it comes to their investing. 06:57 Beau Henderson: It was just because, this is the thing, it’s not… The hard part is that we’re dealing with… You’re getting into my thing here, I’m talking about behaviour. We’re getting into… People… You can make something look like it makes sense on the spreadsheet, but we gotta deal with what’s functional in these families’ lives. And like you said, it’s got to relate to their goals and objectives, or one, they’re not gonna stick with it. Or if we’re not helping them understand why they’re doing what they’re doing, then something… Heaven forbid something happened to me or you and they don’t trust the next person in line, they might be worse off than when they met us. 07:36 Kate Stalter: Oh, that’s a really good point. Let me give you a couple of examples. I think I know this study. Is that DALBAR? The study you’re talking about. ‘Cause I’ve seen. 07:42 Beau Henderson: Yes, I believe it is. 07:43 Kate Stalter: Yeah, I think so, I think so. They have some great research. I had a good example and I love to use this story. So, everybody… If I ask people these days… I like to play this, it’s a fun little game. I like to say… I ask people, “Do you remember what the big scary thing was in the media at the end of 2012?” So we’re going back three years, and I’m not gonna put you on the spot here Beau, because I wouldn’t be able to remember this myself if I weren’t telling the story, and that’s kinda the point of this, is that nobody remembers what the big scare was in the media three years ago. I’ll tell you what it was, it was the fiscal cliff. And now you remember all the CNBC, Fox Business, Bloomberg, everybody, all the magazines going crazy about the fact that the fiscal cliff, if Washington did not come to some kind of deal, US markets were absolutely going to tank. People were selling out. Real live American investors were listening to this, taking advice from television pundits, selling out their accounts. And I’ve met people like this, so I’ve seen this numerous times. What ended up happening was, 2013 as you recall, the S&P 500 was up more than 32% that year. Not what anybody would have predicted at the end of 2012, right? So all of these people took their money out of the market, put it in cash, missed that rally in 2013. 09:14 Beau Henderson: Right. And it’s… Sometimes Kate… And you’ve been working so much in the media over the years, sometimes I think it’s harmful, the media’s actually harmful, but when it gets the story that it almost elicits some of that kind of emotion or fear, they just like to run with it to the point to where it may actually cause people to do more harm than good. 09:33 Kate Stalter: Completely. And there are smart people that are these journalists and producers in the media, I’m not gonna say they’re not, but we have to remember their goal is to sell advertising. 09:48 Kate Stalter: They are not your financial advisors. And people get this mixed up. So I think if you’re going to watch this stuff… I’ll tell you where I think it’s just interesting as just for maybe general business news. If you’re just kind of a news geek and wanna find out what’s happening in the world of business, then those channels are actually pretty good. 11:19 Beau Henderson: Exactly. Well, so Kate, somebody comes to you or they come to the firm and… This is a question I get a lot even after somebody reads the book or whatever, and my initial outreach is where do I start? And where do you tell somebody that says, “Okay, Kate’s making some sense here. There’s probably a better way to build this plan out or do financial planning right.” Where do you start? 11:46 Kate Stalter: Yeah. And we get those calls as well, and it really depends on your situation ’cause everybody’s situation is different. We have a couple of things we just instituted ’cause my firm just expanded recently. Lorraine Ell is the new CEO of my firm. And I’ve worked with Lorraine for… Wow, about four years now in total. So, we very much… We work together well, very much looking forward to bringing on some new services right now. One of the things we’ve introduced is called The Money Decisions Project. And that name was chosen pretty deliberately, Beau, because it is a project. It’s an ongoing process. What we’re really, really avoiding is that old methodology of when the financial planner goes to their software, crunches some numbers, cranks out a bunch of tables and charts, plops a book down in front of the client and says, “Here you go. Here’s your plan.” I mean, I’ve made that mistake. I think most people who are new to the industry, you make that mistake. And you learn from that. 13:55 Beau Henderson: Right. Now, that is one of the biggest things… I see, Kate, what you’re referring to is a problem with the financial services industry… We’re going back to that cookie cutter approach. Let’s put some stuff in some software and here’s what you should do because you’re a 66-year-old couple living here. And it’s not… People are not cookie cutters. And I like that what you’re doing at Better Money Decisions is… It sounds kind of funny that I’m saying this ’cause it seems so obvious, but you’re actually making customized plans for people. 14:30 Kate Stalter: Right. That’s right. That’s right. No two situations are the same. And you just… This is a little bit of a big problem, I think, with some of these software programs. And really the mind set of the industry that just kind of assumes that everybody, like you said, they’re 66 or they both have the same birthday, so everybody’s the same age. They’re both 66 years old and you’ve got “x” amount, you got your money all set for retirement. I want to tell you something, and you see this too. I feel like the industry as a whole is still geared towards the pre-baby-boomer generation. Because everybody’s talking about Millennials now, but I got news everybody that the boomers are gonna be around for a long time. Not dead yet. And I’m one of those young boomers. I was born at the very tail end of that so I’m counting myself in that. 15:35 Kate Stalter: And many of the boomers are going to be in the workforce for a long time to come. So, it’s interesting because boomers didn’t save. Just didn’t. Particularly, some of the older ones. I think maybe the younger boomers are a little more like Gen Xers and kind of caught on a little bit more like “Hey, the world is changing.” But I think the older boomers in particular did not save. Kind of had the rug ripped out from underneath them frankly. Because the workforce changed, technology changed, and some of them were just not prepared. So, to walk into a financial planning situation with a couple that’s 66 years old and to assume that they were as prepared, perhaps as their parents might have been, I think that’s a mistake. 16:28 Beau Henderson: And that makes me think of something else. A lot of times, Kate, I’ll see somebody will come in and it’s after… They probably should have come and had a conversation 10 years ago, but there was a lot of anxiety or fear or shame that, “I’m not where I should be.” And you brought up that point. And I think this is very valid for people to hear is, it’s so much better to have a hard conversation now, than us get 10 years down the road and we have to have a hard conversation with less options in the future. 16:57 Kate Stalter: Oh heck yeah. That’s very, very true. I think… And I’ve seen this. I’m sure you have too. I do think… This is tough for financial planners because people… You wanna work with people. You meet somebody, you’re like, “Oh you’d be a great client. Would love to work with you.” But then it’s tough. You’re like, “Oh I may have to deliver some unpleasant news here.” And nobody likes that. I mean people… Most people don’t like confrontation or even an unpleasant discussion. And you’re right, people feel guilty. And we all do. I talk to a lot of people just not only clients, but also friends, acquaintances, and I think… How often does it come up? The idea of, like you said, “Oh. I should have done this 10 years ago.” Okay. You didn’t. That’s alright. Now, let’s start today. 17:51 Beau Henderson: Yup. Let’s do the best we can with where we are. And this is one place I think logic… Let your logic rule here. Logically, when you say that Kate. Of course, I want somebody that’s gonna tell me the truth versus be a cheerleader, and kinda just gloss it over. But as humans, a lot of times, we go towards that emotional side. It’s just easier sometimes. But this is a place to where that… When you’re looking for that financial professional or that partner in your life, look for that, look for somebody that’ll say, “Hey, you know, you wanted to retire at 62, it’s gonna be 66, unless we do this, this, and that.” That reality and honesty, is really what you should be paying that person for. 19:15 Kate Stalter: But she said, “I can definitely do that.” Oh, and by the way, her husband, she was going to inform him he was also going to work for two more years. As soon as they knew that, they were fine. 19:54 Kate Stalter: That’s very true. No, you’re right about that. It’s not… It’s pretty interesting because… I think… I’m just gonna say this. I think Americans, in general, we are kind of in-numerate as a society and it’s kinda sad. You do, you run into people… I’ve literally run into people with $150,000, no real source of income other than maybe social security, and they are convinced they can retire and leave something to their kids. I’m like, “Yeah, I know… I guess that sounds good, but let’s just be real. I’m just trying to get the point across today is these are the cold hard facts you have to confront. Okay, you have $150,000, you have your social security, maybe you’re not gonna be able to leave anything to the kids. If you kind of frame it that way, you can accomplish some of what you want, but let’s worry about getting you to a 100 first. 21:34 Kate Stalter: Well, that’s right. It’s all… We’re making decisions all the time. Everything we do is a decision. I just wrote a column for the Santa Fe New Mexican not long ago, got some really good feedback on it, ’cause one of the points I made is that even inaction is a decision. You’re deciding to do nothing. Even if by default, you’re deciding to do nothing. 21:58 Beau Henderson: That’s your financial plan. 21:58 Kate Stalter: Right. Not a great idea because like you said that will catch up with you. 22:05 Beau Henderson: Well, Kate, there’s so many things I wanna talk to you about. We’re gonna have to do some more. If you’re open to it, why don’t you… You’re always digging into these topics, doing this research. How about you be an expert contributor on The RichLife Show, and we’ll see if we can… One of the things I wanna talk to you about soon is the changes in social security, and what we need to know, ’cause I know you’ve looked into that. We’ve talked through out the whole… We’ve talked through our show time already. 22:30 Kate Stalter: That’s great. That’s crazy. Great conversation. I would be happy to come back and talk about social security because Congress just changed the rules, and we definitely wanna inform as many people about that as possible. 22:43 Beau Henderson: Yes, there’s stuff people need to know. Now, Kate, people that like what you’re talking about maybe need to have a real conversation. How do they get in touch with you or follow up with what you do? 22:53 Kate Stalter: My firms’ website is bettermoneydecisions.com, and you can reach out to us from there. You can read about the Money Decisions Project, meet the team members on there and reach out. We’d be happy to help. 23:08 Beau Henderson: There you go. Another great guest giving us the expertise to help us live that definition of a rich life, where we can have success with both life and money. We’ll see you right back here, same time, same place next week on The RichLife Show. You don’t need someone to pick stocks or time the market. Those activities, touted non-stop in the financial media, have absolutely nothing to do with your personal financial goals. That’s why Kate Stalter founded Better Money Decisions: People face any number of financial decisions these days. But with the financial media encouraging all kinds of bad behavior, like trying to predict market direction or gambling on what the Federal Reserve might do, the odds are stacked against the person just trying to make good financial decisions for the short and long-term. Before becoming a Series 65-licensed advisor several years ago, Kate wrote in-depth market analysis for Investor’s Business Daily. She hosted the Daily Stock Analysis and Market Wrap videos on Investors.com, and taught Investor’s Business Daily live seminars throughout the country. She also hosted the Small Cap Roundup radio show on the Tiger Financial News Network, interviewed hundreds of asset managers for the “Daily Guru” feature on MoneyShow.com, and wrote mutual-fund analyses for Benzinga.com. Although she still contributes to Forbes, US News & World Report and TheStreet, Kate’s primary focus is helping clients around the country who face decisions about portfolio allocation, Social Security strategies, insurance needs, estate planning, college funding and all manner of financial questions. “Although financial decision-making becomes more complicated every year, many people still believe a financial advisor’s value comes from stock picking and timing the market. But that’s not the value. In fact, that’s speculating and gambling, exactly the opposite of good financial decision-making,” Kate says. Kate has a fiduciary duty to put clients first. As her client, that means understanding your unique goals and concerns. It means being your coach throughout different market and economic cycles and helping you stay on track, even while the TV anchors and magazine writers tell you the world is coming to an end. “Investors continue to be hurt because some TV anchor says it’s time to panic. That TV anchor, meanwhile, has no responsibility for your well-being in retirement, or even if you are able to retire.” Kate says. Kate enjoys helping people make those “peace of mind” financial decisions. For example, the age at which you and your spouse begin taking Social Security can make a tremendous difference in your household income over the next few decades. Nobody wants to leave $100,000 or more on the table, but it happens all the time! This is the kind of situation Kate helps clients avoid, in favor of making better decisions about money! A graduate of Saint Mary’s College in Notre Dame, Indiana, Kate spends fall Saturdays watching the Fighting Irish on the gridiron. Her MBA alma mater is Northwestern, so she also likes to see the Wildcats win, unless they are playing Notre Dame! She has a houseful of rescued animals, and is trying to get her 5K speed just a tiny bit faster.